A kind beauty school student helped transform a depressed teen's hair after she hadn't combed it for months. 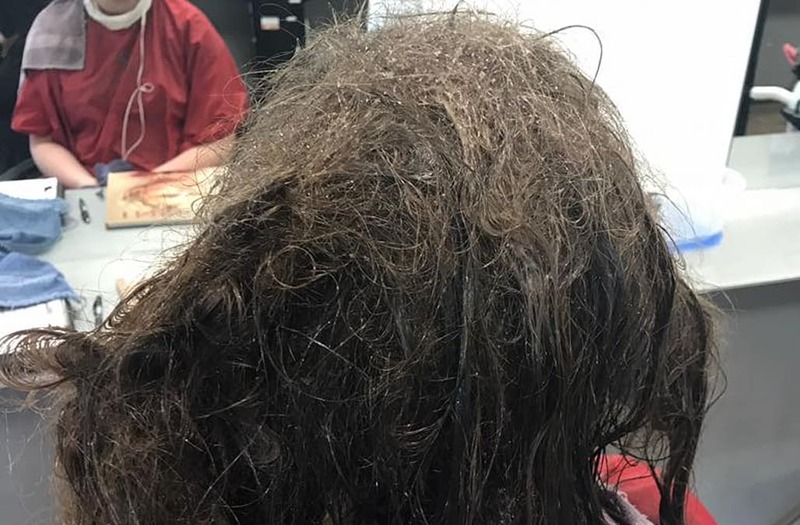 Kayley Olson, who attends Capri College in Iowa, said the 16-year-old walked into the school's salon on Monday with her hair completely matted and tangled. The 16-year-old said she had school pictures to take for the upcoming school year and didn't have much confidence that her hair could be salvaged so she asked Olson and a co-worker to shave it off. "She said 'it's worthless.' I knew right then and there we had to make sure we kept her hair for her," Olson, 20, told InsideEdition.com. The teen, who Olson has chosen not to identify, expressed to Olson that she'd struggled with depression for some time, but this year she wasn't even able to get out of bed. "I was heartbroken. I know what if feels like to feel worthless and depressed. It was kind of wake up call. We had to help her," Olson said. "It was a extremely hard. She cried the entire time we were combing it out." Olson said it took two days and several breaks in between to get the teen's hair entirely untangled. Olson did the final cut and style herself. "When I got the last knot out of her hair, I looked at her and said 'it's all out' and we cried happy tears," Olson said. "When I showed her the final result in the mirror she said 'I am going to smile in my school pictures. You made me feel like me again.'" Olson shared before and after photos of the teen on her Facebook page and the post has since gone viral. "Mental health is a thing, it effects people all around the world and of all ages!," Olson wrote on the post. "Parents take it serious. Don't just push your kids off and tell them to get over something they legitimately can't. A CHILD should NEVER feel so worthless to not even want to brush their hair." The post has been shared more than 65,000 times. "It really truly warmed my heart that I could do that with something as little as a haircut," Olson said.